2018 Shelf Unbound Best Indie Book, Notable“With a mixture of fantasy and all things Heaven and Earth, this tale combines the stories of several characters into an intricate, twisting plot.” — Tonja Drecker, author and book reviewerMellis, a courageous and resourceful young woman, is kidnapped from the human world and taken to the Space Between by a tribe of faeries called the Penitents. Because of guilt over an ancient sin committed by their angel ancestors against the Maker, the Penitents have cursed themselves with grotesque physical disfigurements. Mellis can help them reunite with the Maker and find their way back to redemption, but she would need to give up the life she's always known to remain in the Space Between. As she struggles with this heart-wrenching decision, one of the Penitents, bent on revenge, commits a gruesome attack against the tribe, and they learn he has taken Satan--the Maker's greatest enemy--as his ally. All in the Space Between are facing grave danger. 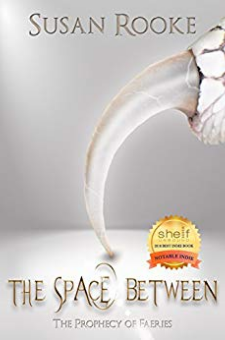 Will a long-awaited act of vengeance save them?Weaving together parallel storylines from the Space Between and the Realm Below for a climactic finish, Susan Rooke builds a rich and fantastical world of angels and demons, monsters, faeries and dragons. Abounding with spirituality and humanity, this faery tale for adults has a cast of vivid characters you won't soon forget.